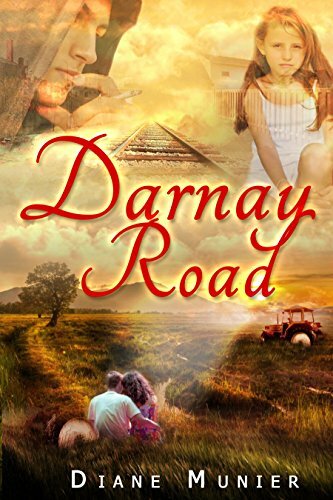 In Darnay Road I try to capture life on an average small town neighborhood street through the eyes of a little girl, ten-year-old Georgia Christine. Through her perspective we get a picture bathed in sunshine with a few dark spots. There is the mystery of the altar in the parish church dubbed Bloody Heart. And a crazy lady who stands on the sidewalk in her slip and talks to her dead husband. And where do the boys go at night when they climb out of their windows and what about that bump on the front of Georgia’s new Ken doll, and why does Granma tell Georgia’s father that he’s missing so much when it comes to her? She doesn’t want him, she doesn’t know him. Then there is her mother who ran off to be a model in Paris, and the picture of a dark haired woman in a beautiful blue dress. There are the tracks behind the houses that line Darnay, there is the run-down neighborhood on the other side of the tracks. Granma calls that place the slums. Georgia’s homelife is idyllic. She is being raised by her grandmother. Her father is a cop in the city and he has a new family. Her mother is dead. Across the street her best friend is being raised in similar circumstances by her aunt. Granma and Auntie make up the stable forces in Georgia’s life. But what about those boys that come from the other side–the slums? Georgia is drawn to the one who lives on his bike. The one who whistles at her while she’s skating. She gets so thrown she doesn’t make the corner and zips into traffic instead. She narrowly escapes disaster with a broken bone. That is the beginning of a true friendship between Georgia and Easy Caghan.